Roofing Contractor, Roofers | Bergen County NJ | Ridgeview Roofing Co. In the event that your roof needs servicing, you have peace of mind knowing we're only a phone call away and that we offer emergency service and free estimates. We can build or install any type of roof required in your home. We use high-efficiency materials designed to be the most long-lasting and cost-efficient on the market. We do not perform assembly-line roof installations in Bergen County NJ. Each project we take on is properly treated as a custom roofing assignment, installed with skill and great attention to detail. A lot can go wrong if a roof is not properly installed by experienced roofing contractors. Our commitment to you is to build total reliability into your roofing system. 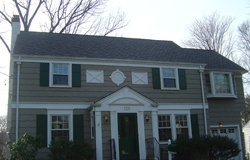 Whether you own a home or residential building, or whether you need roofing service or installation in Bergen County NJ, our goal is to provide you with the very best roofing service available today.